ELKO — County Commissioner and longtime Elko attorney Grant Gerber died late Saturday night from injuries suffered earlier this month on the Grass March/Cowboy Express. His funeral was held Nov. 1. "Dad passed last night at 11 p.m. surrounded by our family telling stories of his life and listening to his favorite songs," said his son Travis Gerber. "He was an exceptional man, but we know his spirit lives on." Gerber and the horse he was riding fell on Oct. 7 while in Kansas. He suffered a head injury but went on to complete the coast-to-coast ride in protest of federal over-regulation of public land. "Thank you all for the outpouring of thoughts and prayers. Dad is truly loved and missed by all," Travis Gerber told the Free Press. 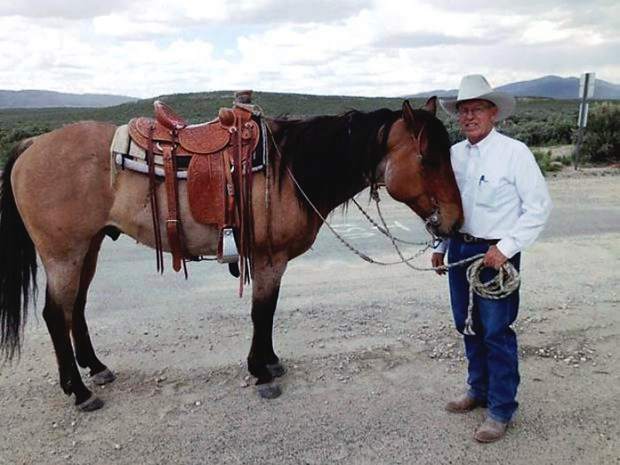 Gerber grew up in Elko County and contributed to many aspects of the community. He was elected to the county commission in 2012. He volunteered to serve on nonprofit boards, including the Great Basin College Foundation's planned giving committee and the Northeastern Nevada Museum Board, as well as the VFW Honor Guard. Gerber worked pro bono for community entities, such as the SnoBowl and the animal shelter. Grant lived by his favorite quote, "Make no small plans. They have no magic to stir men's souls." He boldly served others and stood for the cause of freedom. Grant organized many coalitions, campaigns, and grass roots efforts including the Wilderness Impact Research Foundation, Kelly Springs, the Jarbidge Shovel Brigade, Klamath Bucket Brigade, Smoked Bear, and the Grass March Cowboy Express, all aimed at protecting and championing private land rights, public land access, and Constitutional principles. In his final ride, he carried petitions coast to coast with the Grass March Cowboy Express from Bodega Bay, California to Washington, D.C., and on to the Atlantic to support ranchers in their plight against federal encroachment on private land and water rights. Grant's horse "Gandhi" stumbled and fell with him in a groundhog hole in Kansas which gave him a concussion. Grant finished the ride to Washington, D.C., and the Atlantic, but on the return trip, he succumbed to complications after surgery in Salt Lake City to relieve swelling on the brain. Although he never made it home, his family was able to gather with him one last time in Salt Lake City to say goodbye and to set his spirit free. He understood the dangers of the ride. Before he left, he wrote to family and friends telling them to complete the ride with or without him, saying, "Please carry on if I am killed or hurt. And then after the petitions are delivered you can then scrape up my old bones and deliver them back to Elko County."